This post was written by Skyler, see his previous post here. In recent months I have been dealing with the sadness of watching a friend of mine lose faith in the gospel of Jesus Christ, lose faith in the LDS congregation where they attend, and decide that for them the benefits of membership in the Church of Jesus Christ were no longer a compelling enough reason to remain in the church. This is not the first of my friends to leave and I am guessing it is bound not to be the last. As a cry to other faithful members of the church, these are some things that I have learned through the process of watching their faith slide and spiritual needs increase. I don’t know what causes a crisis of faith. To my knowledge I have never had one, but I have had the great opportunity to talk with many friends as they have had experienced a crisis of faith. Many of those that I have talked with have bolstered their faith and stayed in the church. I believe that we must give all that we have in creating a culture of acceptance and understanding in order to accept and love those who feel that their faith is being kept back by some sort of stumbling block, and be a resource that they have to stand on. 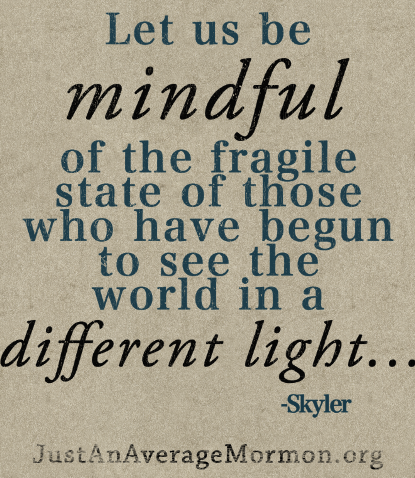 Let us be mindful of the fragile state of those who have begun to see the world in a different light, lose faith in our Savior or church leaders. Many times they have brought their concerns to a leader, family member or other friend and have received accusations or judgments. It is my experience that they aren’t questioning simply because they were offended or wanted to sin. Usually the reason is a thoughtful one that has sometimes been followed up with much study of scriptures. Referring them to the Lord’s help and the scriptures should always come first, because the Spirit is our most effective resource; however if they feel they have received too little of an answer we should still not count them as sinners. We are commanded by the Savior to love our God and love our neighbor. We are also commanded not to judge. If there is someone who earnestly wants to find good reasons to stay in our congregations we have the duty and obligation to love them and help them in the best way we can. As we grow up we are rightly taught that we should lean not unto our own understanding. We are taught to have faith, to trust our leaders and to fill our callings. This is an essential part of the gospel and it keeps the church together. Yet as we perform our tasks faithfully, we must not follow blindly. We should try to gain discernment from the Spirit along the way. This is why we need our brothers and sisters who may be more in tune with some of the more challenging aspects of our faith. Sometimes they may be the only ones to notice the slight signs of apostasy that can creep into our meetinghouses. Gifts of the Spirit wouldn’t manifest differently if they weren’t needed at different times and in different ways. “Wo be unto him that is at ease in Zion!” Who are we to argue with scripture? How can we judge a member that has questions about little discussed elements of church history? Or question the management of the church’s investment portfolios? Or the temple? The list could go on. Those experiencing a crisis of faith are in an extremely sensitive situation. They sometimes feel mislead, judged, forgotten, or falling behind. I hope that we can help them stay with us, so that they can help us be faithful as they stay. We need to watch out for apostasy from all directions. Let us continually learn from our faithful brothers and sisters as well as our doubtful brothers and sisters, that we may all follow the Savior’s example as we strive for perfection in this imperfect life. I’ve provided a couple of links from brethren that describe dealing with spiritual ambiguity much better than I do.